Polish Interior Minister Mariusz Blaszczak has accused the opposition of trying to seize power, just as thousands once again take to the streets across the country to protest against the government. After police broke up a blockade of the parliament building in Warsaw in the early hours on Saturday morning, several thousand protesters again poured into the streets of the capital and other cities, according to Reuters and photos posted on social media. Blaszczak described Friday’s protests as “an illegal attempt to seize power” while speaking to RMF FM radio on Saturday. His statement hasn’t daunted the protesters, however. "We will be on the streets until they are done destroying the country," Mateusz Kijowski, the leader of the Committee for the Defence of Democracy movement, also told the crowds. Reacting to the protests, the President of the EU Council, Donald Tusk, urged Poland’s authorities to respect the constitution. “I appeal to those who have real power for respect and consideration of the people, constitutional principles and morals," Tusk said, as quoted by Reuters. This current stalemate is one of the biggest in Poland’s parliamentary history. On Friday, after opposition lawmakers blocked a vote on the state budget, the ruling parties voted in another hall – a move the opposition says was illegal, while claiming that the vote was falsified. On Saturday, several thousand protesters rallied in front of the Presidential Palace in the Polish capital to demonstrate against a string of measures set to be taken by the government. In particular, restrictions are to be placed on the media’s access to lawmakers in parliament, and new regulations limiting the number of TV stations at debates to five are set to be introduced. 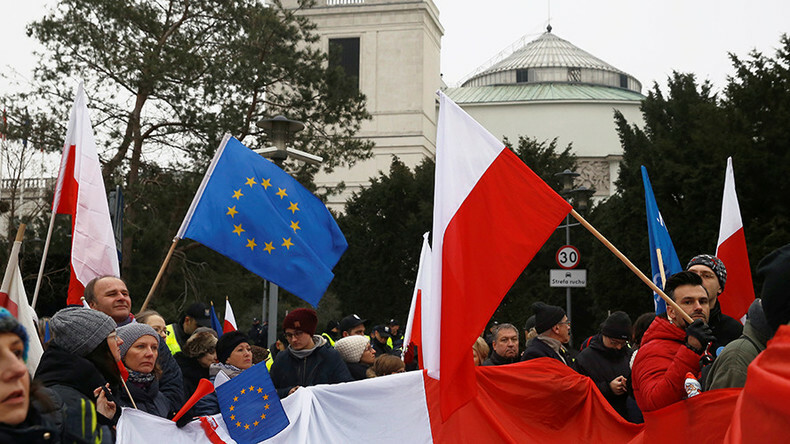 About 2,000 protesters chanting “freedom, equality, democracy!” while waving Polish and EU flags eventually marched from the Presidential Palace to the parliament. Opposition leader Petru told the crowd that Poles would not accept the “dictators” who are trying to restrict journalists’ access to parliament, AP reported. Protests erupted after the vote on Friday, with thousands taking to the streets and police using force – and, according to some reports, tear gas – to clear the way for Kaczynski and a few other top members of parliament, who left the scene in a vehicle. The protests’ hashtag, #WolneMediawSejmie (Free Media in Sejm), is now trending on Polish-speaking Twitter feeds. The rallies in Poland clearly point toward greater political divisions in the country, Joaquin Flores, editor in chief of Fort Russ News website, told RT. "There is a deeper political crisis under all of this and that's what's going on,” Flores said. “Of course, on the surface we have a fight over a new piece of legislation which severely limits the access of journalists to the house of parliament itself. But many critics see this of course as something that's going to have a bigger chilling effect and could even go deeper to silence alternative voices."